Though the crowning ceremony of the 2019 NICEIC and ELECSA Electrical Apprentice of the Year is set to take place on June 4th, there have already been some winners. Official competition partner, Scolmore Group, offered up prizes to those colleges who entered 20 or more candidates and the company has been on a tour of the country to hand over the College Packs to the qualifying colleges. 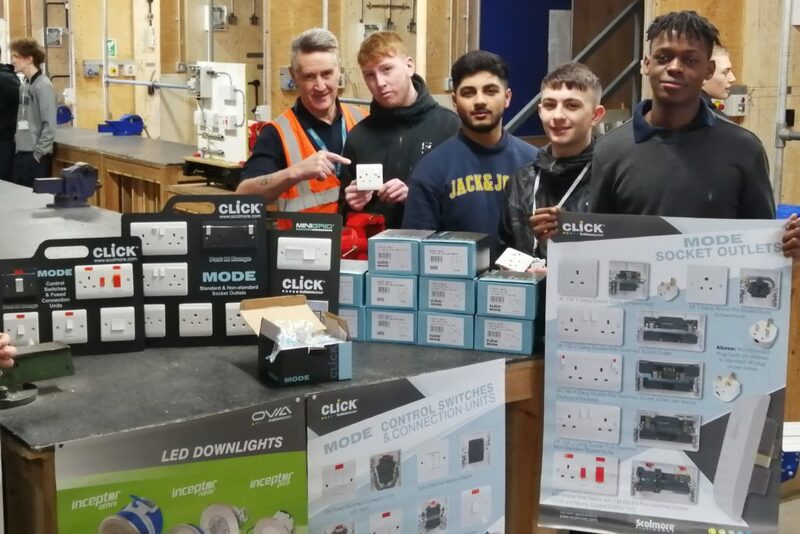 Leicester College, Loughborough College, Beau Associates JTL, Highbury and the Focus Training Group were the lucky College Pack winners and they were presented with their goodies by Scolmore’s Exhibition Manager, Lee Taylor. The College Packs comprise 25 Double Sockets, 25 Switches, 25 6” Pendants and 25 Batten Holders. In addition to these packs, Scolmore will be presenting the college that produces the overall winner of the competition with £1,000 worth of Scolmore products. This year, more than a thousand apprentices from across the UK registered their interest in the competition, with more than 650 completing the first stage – an online assessment of 40 multiple-choice questions. The top performing 20% went through to the second stage to undertake a 90 minute written exam, and these have been taking place at various locations across the UK. Eight students with the highest scores from stage two will go through to the grand final which will take place at Scolmore Group’s head offices in Tamworth, Staffordshire, on Tuesday, 4th June, when candidates will be required to complete a number of challenging practical tasks over the course of the day. The Electrical Apprentice of the Year will be crowned at a special barbecue and awards ceremony to be held at The Belfry Hotel & Resort that evening.